Several successful campaigns have been launched under our “Start Living Healthy” brand. 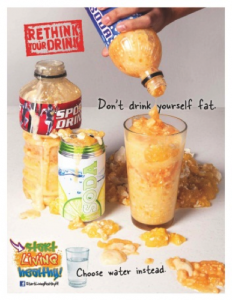 Most recently, the youth-focused Rethink Your Drink campaign (2013) encouraged teens to choose water over sugary drinks like soda or energy drinks. You can print the Rethink Your Drink Posters or visit our YouTube Channel to watch the Rethink Your Drink public service announcements and other informative videos. Fruits and Veggies. Good Choice (2008). 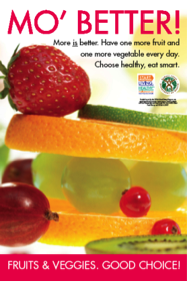 Encouraged adults to eat one more serving of fruit and one more serving of veggies every day. 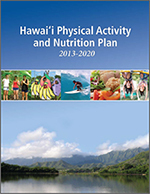 CDPHPD’s Healthy Hawaii Initiative (HHI) worked with grocery store partners that provided discounts on fruits and vegetables and coordinated special events to promote their consumption. Step It Up Hawaii (2007). 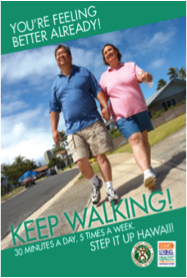 Encouraged adults to walk at least 30 minutes, five days a week, and to build physical activity into their day. Included community walking events and incorporated messages related to worksite wellness. 1% or Less (2004 & 2005). Encouraged high-fat milk drinkers to switch to low-fat milk. The campaign featured public relations and taste test activities. About 65,000 Hawaii residents switched from high-fat to low-fat milk as a result of the campaign. See the article “Statewide Implementation of the 1% or Less Campaign” for more information.